Family ownership and leadership of a business is much more likely to yield the long-term commitment, risk-taking and investment, passion for the work of the company, innovation, nurturing of talent, and caring for stakeholders that produce excellence in business over a long period of time. Research in the field of family business solidly supports this proposition, and the family businesses in this book vividly illustrate it. 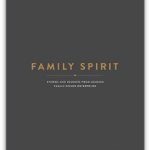 Family Spirit celebrates the perseverance and triumphs of 12 multigenerational family businesses from across the globe whose stories of entrepreneurial drive, superior performance, and family commitment offer timely inspiration. Featuring gorgeous photographs from the archives of each family, this unique collection offers wisdom handed down over generations, alongside contemporary insights and lessons of succeeding in business against great odds. To celebrate the journeys they are on and the spirit of adventure they share, the families profiled gathered to map their parallel courses over the next 50 years, highlighted in the New York Times in May of 2015. They challenged themselves and one another to continue to grow and innovate companies that will still be privately owned and family controlled when their descendants meet again in 2065. All proceeds from the sale of Family Spirit will be donated to the New York Public Library’s Science, Industry and Business Library to enhance resource centers and add books to the library’s collection.